Thousands of people have celebrated the first emergency services day to honour the contribution of crews across the UK. Also known as "999 Day", the event in Manchester started with a two-minute silence at 09:00 BST, on the ninth hour of the ninth day of the ninth month. A thanksgiving service was held in the city on Friday to honour those who have died in public service. Prime Minister Theresa May said the UK was "indebted" to emergency staff. The National Emergency Services Memorial charity (NESM), which organised the event, is hoping to raise £2m to build a national cenotaph. It will honour the 7,000-plus personnel who have died in the line of duty, as well as the more than one million staff currently working in the services. Mrs May, who has backed the memorial, said: "The men and women of our emergency services are there for us when we need them most. "As a nation, we are indebted to them for their courage and their sacrifice and it is absolutely right that we should honour their incredible service in this very special way." 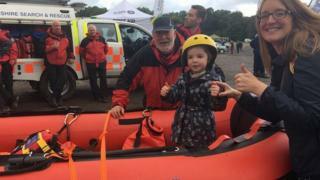 Thousands of people attended the main event at Heaton Park in Manchester, where they learnt life-saving skills and could sit in old and new 999 vehicles. People also watched demonstrations and could speak to different emergency service workers. Tom Scholes-Fogg, who founded NESM, said: "I am delighted that the charity and its aims have the support of our prime minister. "The NESM, festival and 999 day are a great opportunity for us all to honour the men, women and service animals who have given so much in the name of public duty."